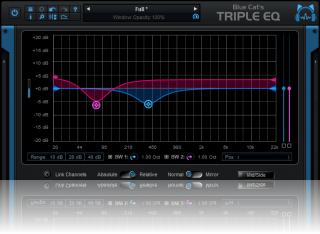 "The easy and free shapeable filter"
The plug-in can be controlled in real time with MIDI or automation: it is capable of absolutely zipper-free clean and continuous time-varying equalization with no latency. it is the ideal companion of our audio analysis tools for signal-dependent side chain filtering. Want more bands? Check out Blue Cat's Parametr'EQ series. 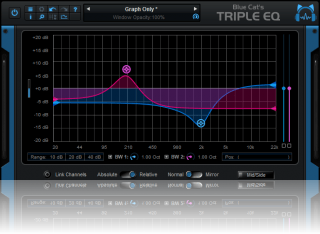 "This three-band parametric EQ is a fine example of Blue Cat's considerable talent." - Computer Music Magazine - issue 148. 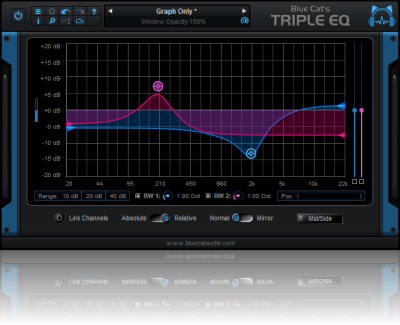 The plug-in now appears in the "EQ" category in Pro Tools. This product now includes both the single and dual channels versions. (Bug fix): the response curve was not updated in some hosts while not processing audio. Fixed a crash when changing the skin from the toolbar menu. The plugin is now free. New toolbar to access the main functionalities. Enlarged the filters frequency range. 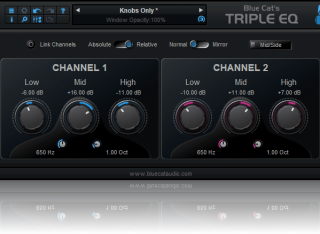 Blue Cat's Skinning language V1.2.2 support.